Love u more than anything...: Happy Birthday Deacon!!! Four years ago when we moved to California I said we would move back to Ohio by the time Deacon was going to Kindergarden. It seemed like a lifetime away. I was so confident in promising this because having a 5 year old seemed so far off. But here we are... we have our 5-year old, who will be going to kindergarden in 3 short months. I say it every year... but where does the time go??? It feels like yesterday I was laying on my kitchen floor (yes, I said my kitchen floor) in Columbus, 40 weeks pregnant, BEGGING Deacon to come out soon... 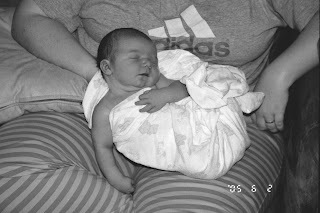 I was hot, miserable, and more than anything, wanted to meet my baby boy. Being pregnant for 41 weeks seemed to last an eternity... that I would never get to meet this baby. I remember thinking the days were dragging by... And now, here we are. I remember staring at this beautiful baby in the hospital on this night 5 years ago... and I had no words. No words could express how I felt for him. I didn't cry... and I really didn't say much. He took my breath away. I think Deacon is one of the most amazing people I know... he teaches me a lot about patience, love and understanding. Being a mom isn't as easy as I thought it was going to be... and along the way there has been a huge learning curve for me. And Deacon is always patient with me while I figure this stuff out. He's your typical boy-- and definitely has has his moments... which is always when I loose my patience. And it's ok for him to act this way... he's a kid. But I should be the one staying calm for him... I'm his mom. But inevitably I loose my cool... and inevitably I feel horrible about it, even hours later, when he's sound asleep... and it's these times I learn the most valuable life lessons. I've been known to go into his room and wake him up in the middle of the night, just so I can apologize, again, for loosing my patience... and in his groggy state of mine he puts his arms around me, pats me on the head (my favorite part) and tells me "it's ok." Forgiveness... with no strings attached. This year for his birthday all he asked for were Legos... which gives you a glimpse of what he loves doing nowadays. He's getting so good at being creative and making his own designs without the help of Damien... though on a typical weekend you can find the two of them playing in Deacon's room building spaceships, cars, etc... these two are good for each other. Deacon has always been a mama's boy... and I think Damien has always had a touch of jealousy about that. But now the two of them bond over Legos... and it's so fun to watch. It still hasn't fully hit me yet that we're sending our baby to kindergarden in 3 months... I'm not sure when it will hit us. I don't even know if it's hit me, yet, that he's really 5. But I'll tell you what- he's sure excited to be 5. It's a pretty neat number, to him... and I'm so proud to watch him embrace life like this. So happy birthday, Deacon James... I love you more than anything baby boy.